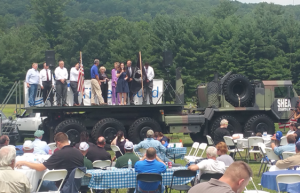 Teams of people from construction and equipment firms joined energy producers, pipeline operators, Pennsylvania legislators and area county commissioners in Tunkhannock, PA late last week for a rally in support of Marcellus natural gas. The event was held to highlight benefits to area consumers, workers and businesses from growing energy operations in the region. Under the banner of Energy Builders, over 30 individuals from EEIA member Pennsylvania construction and equipment suppliers joined more than 400 energy and pipeline workers from northeastern Pennsylvania’s rich natural gas fields, to show support for energy production and the infrastructure needed to deliver it to consumers. Rally speakers included Pennsylvania Senator Lisa Baker and Representatives Jonathan Fritz and Alan Kaufer, along with Susquehanna County Commissioner Alan Hall and Bradford County Commissioner Doug McLinko. Other rally sponsors included Cabot Oil & Gas, Southwestern Energy and Williams Companies. To sign up for alerts for future events and to see what is happening in your area, click here.